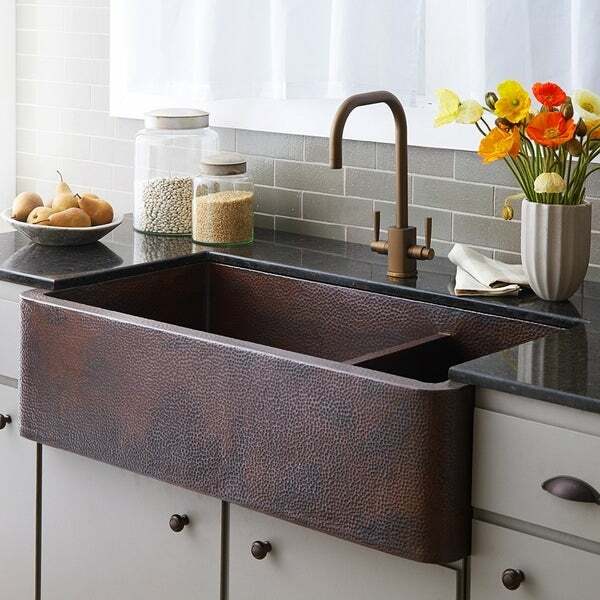 Farmhouse Duet Pro copper apron-front sink provides an enhanced workspace for those who love to spend time creating masterpieces in the kitchen. This double-bowl copper kitchen sink makes prep and cleanup a snap. Farmhouse Duet Pro apron front kitchen sink is artisan crafted; forged of high-quality recycled copper. Be sure to browse through our sink accessories to find the coordinating sink drain and sink grid to complete your design. Important: Due to the handcrafted nature of this product, it will vary in finish, texture, and other details. Dimensions may vary up to 0.5 inches. We recommend waiting for the actual product before making installation cuts. Dimensions 40.0 In. X 22.0 In. X 11.0 In.